On July 4, 1845, Henry David Thoreau moved into the cabin he had built on the shore of Walden Pond, thus beginning the most famous experiment in simple living in American history. On the 150th anniversary of that event, Houghton Mifflin, successor to Thoreau's original publisher, is proud to publish a new edition of Walden, annotated by the distinguished Thoreau scholar Walter Harding and illustrated with Thoreau's own drawings. Even those who have read Walden many times will find much that is new in this edition, and those reading the book for the first time will discover why it has changed the lives of generations of readers. Nature was a form of religion for naturalist, essayist, and early environmentalist Henry David Thoreau (1817 62). In communing with the natural world, he wished to "live deliberately, to front only the essential facts of life, and learn what it had to teach." Toward that end Thoreau built a cabin in the spring of 1845 on the shores of Walden Pond on land owned by Ralph Waldo Emerson outside Concord, Massachusetts. There he observed nature, farmed, built fences, surveyed, and wrote in his journal. One product of his two-year sojourn was this book a great classic of American letters. Interwoven with accounts of Thoreau's daily life (he received visitors and almost daily walked into Concord) are mediations on human existence, society, government, and other topics, expressed with wisdom and beauty of style. 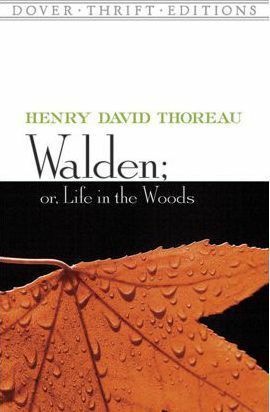 Walden offers abundant evidence of Thoreau's ability to begin with observations on a mundane incident or the minutiae of nature and then develop these observations into profound ruminations on the most fundamental human concerns. Credited with influencing Tolstoy, Gandhi, and other thinkers, the volume remains a masterpiece of philosophical reflection." Essayist, poet, and philosopher, Henry David Thoreau (1817-62) ranks among America's foremost nature writers. The Concord, Massachusetts native spent most of his life observing the natural world of New England, and his thoughts on leading a simple, independent life are captured in his best-known work, Walden.